Each year we are proud to donate up to 10% of our Earnings towards Organizations like Worldvision. More than a decade ago our CEO, Dietmar Dold, adopted a child from Tanzania via Worldvision and since that time Worldvision is one of our preferred and reliable addresses to see our donations in good hands. In 2011 we achieved the best revenue in the history of Lean Interim a few 100’000 CHF above budget. For this reason we decided to donate in our region and in a great experience for visitors of the Zoo of Switzerland. The Parade of the Penguins at the Zoo in Zurich is a highlight for kids, young and old. We are proud to adopt a Humboldt Penguin at the Zoo of Zurich. 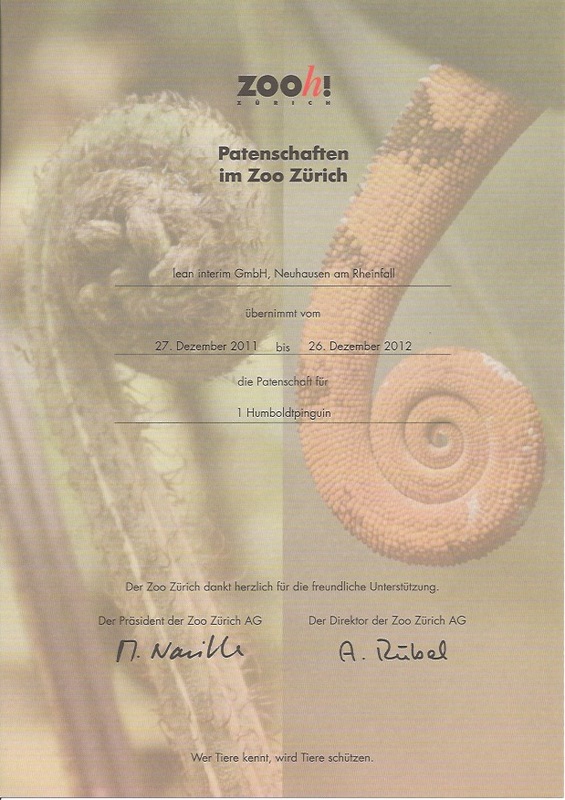 Please see the Document (in German) attached and go and visit the Zoo and have a look at our Lean Interim Penguin.